The well-received VitaClay’s organic rice cooker got some interesting upgrades. Slow Cooker Pro is updated with a smart organic multi-cooker. This is a slow cooker, rice cooker, steamer and it even makes yogurt. As the brand name suggests, the product is made with unglazed and natural Zisha Clay. This material helps to improve flavor while they preserve the nutrients and enzymes. The Vita-Clay VM7900-8 comes equipped with multi-program functions which give you a wide array of options. These range from Savory stews to Soups, from pot roasts to white or brown rice. Don’t forget this warmer can also make yogurt. VitaClay is known for its ability to prepare wholesome meals which includes vegan dishes, whole meals and much more only in half an hour. But does the new rice warmer meets our expectation, let’s find out! This is a first! VitaClay products are not only well received, but they are awarded accolades for their innovation. The case with Vita Clay VM7900-8 is no different. While there were many skeptical people about this product and how it should be designed in the first place. The change this rice cooker wanted to bring was acknowledged. This organic multi cooker comes with a multitude of features. None of which fails to impress us. It has four different cooking modes. These are digital steaming, slow cooker, low temperature and the yogurt maker. Digital Steaming is efficient as it uses extra pressure to reduce the cooking time and produces a better flavor. This cooker is a class apart and faster than any other rice cooker we reviewed. The best thing about this cooker is it can make probiotic yogurt. This is unique and rarely found in any rice cooker. The Rice cooker is not made with aluminum, nonstick or any other toxic material that you will find other cookers being made off. The VitaClay took a completely different approach and came up with a revolution. They used Ceramic which is safe for our healthy. Moreover, the unglazed natural ceramic is known for promoting health. It’s the best in the category as it boosts best features and is easy to use and clean. It is in the mid price range, but for the features, you get, definitely worth the price. This is a mid-range product but the features you are being offered; it’s hard to miss. The yogurt recipe is something we all can use. If you nail it, you can bring a revolution in your diet. 10 minutes to 5 hours pre-programed cooking. 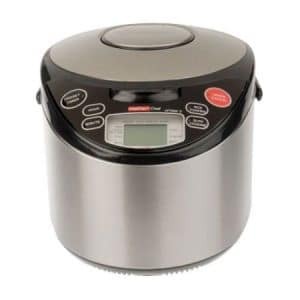 Find the best price for the Vitclay and get one of the fastest rice cookers out there. The the rating is not bad at all on Amazon, with that being said, there is no need to say that buyers hold it in high esteem. It’s among the best sellers and highest rated product on Amazon for a reason. It has an affordable price and an impressive spec sheet! I didn’t use much of VitaClay products. So I was a bit uncertain what to expect from this cooker. I was tipped off by a friend that its pro health and being a fitness freak, I had to try it. All I can say is I am glad I bought it, worth the money. I bought the Vita-Clay VM7900-8 under the recommendation of my doctor. I am supposed to eat a lot of yogurts and hence this product. I wasn’t much into rice as making them is such a headache. This product changed that perspective. While the rice cooker and yogurt maker is highly praised, there is some criticism to account for. A few criticized the product, no surprise here the reason it was criticized is that it broke out of the conventional and went on to try something on its own. The ceramic pot is a new approach but let’s face it, this may break down. But doesn’t that make the rice cooker obsolete, though. These pots are strong and will last a good many years if handled with care. VitaClay’s VM7900-8 features state of the art ceramic cooking bowls that are made of Zisha Clay. This material gets rid of non-stick surfaces and improves the flavor of the end product. All while maintain the nutrient value of the dish. This rice cooker does a lot more than the name suggests. It can make stews, porridge, soups, roasts, yogurt and even yogurt cheese (if you pull it right). To sum up, this is a great rice cooker which boasts great features. No doubt that it’s a top end appliance that offers great nutrient value as compared to its competition. The VitaClay’s VM7900-8 performs exceptionally as compared to other options. This is a one of a kind multi cookers that looks and feels conventional on the outside while it’s a technological wonder on the inside. We say it’s worth buying the product if you are interested in the Clay and construction inside and what something more eco-friendly. If you did not find that is is the right one you can fine more here in our rice cooker review guide.